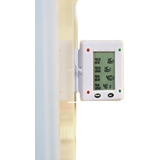 Your Model RF-02 Digital Refrigerator/Freezer Thermometer is the newest and most innovative electronic thermometer that accurately indicates the instant temperature of your refrigerator and freezer. It also computes and displays the weekly average temperatures for both. You can set weekly average temperature maximums. This is monitored and indicated by four small lights. Two green lights if the average weekly temperature for both your refrigerator and freezer are within the range of set maximum temperature +/- 3ÂºF and red if they are out of the range.